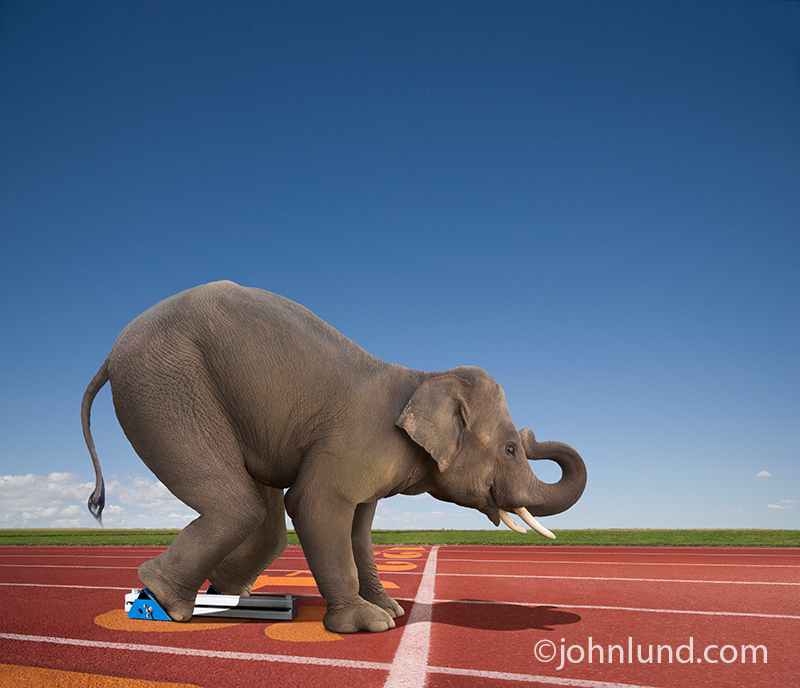 I love coming up with funny stock photo ideas...like Elephants in starting blocks! A friend of mine, fellow photographer Tanya Constantine, left a message for me on my Facebook page in which she lamented that there is too much emphasis on the money aspect of photography, not enough on the love and passion for the art. I was reflecting on that as I drove home from my studio this evening. I spent the day creating stock images, including the elephant in the starting blocks at the top of this blog. I was doing it for the money. But I do love the work as well. I love coming up with ideas, ideas that will amuse and at the same time deliver a message, a commercial message no less. I love the process of putting my images together, the planning, the photography and the Photoshop work. I love finishing an image and just plain enjoying it. The money, however, is also important, and in several in a couple of ways. Obviously, I want to maintain a certain standard of living, put some away for when I reach the point where I can’t work as much…or even don’t want to work as much. And the money is important in another way too. It is a measure of my abilities, a yardstick by which I can judge my progress. For better or worse, I take pride in the fact that I can make money at photography, and yes, it makes me feel good about myself. How Can I Make Money With My Photos? One often hears, or reads, that this photographer or that photographer would do their work whether they were being paid or not. I often wondered if that were true of me. I really don’t know. I do love creating images, but seldom create ones that won’t earn me money. Even on vacation or traveling I will find myself reaching for my camera when a potential shot catches my attention, and yet I am always wondering if and how I can make money with the shot. I have foregone some pretty cool shots because I couldn’t see how I could make money with them. Part of my thinking goes that if I don’t have a market for the image it will be wasted. No one will see it. I have so many images that know one will ever see, some really great ones too. But I don’t have the time, or I suppose, the inclination, to get them online, to enter shows, to make prints (and where would I hang those prints? ), to get them in front of an audience. Just thinking out loud here. I am interested in why I take the approach I do, but I certainly am not unduly bothered my how I operate. As I said, I do enjoy what I do. I love making my images. I love sharing my images, be they funny elephant pictures, silly cat photos, or businessmen in odd, funny and precarious situations. I to confess though, I really love making money off of my images too. I love making stock images too. I especially love when images turn out the way I want them too. But there are times when I do not feel very motivated to work on stock images. Those are the days when I often walk out and take images of nature. They may end up for stock, or just on my blog to be enjoyed by friends and family. I like that too and helps me keeping up the love for photography in itself. However, photography is not my main income source and sometimes I am glad it isn't, because I am not pressured by money to always shoot images that have a market - sometimes I can just go out and play and watch the light. I am not original anymore if I say it now, but I feel that what you explained, about photographing not for the sake of money, but for money as an "indicator of esteem", is what I think myself. 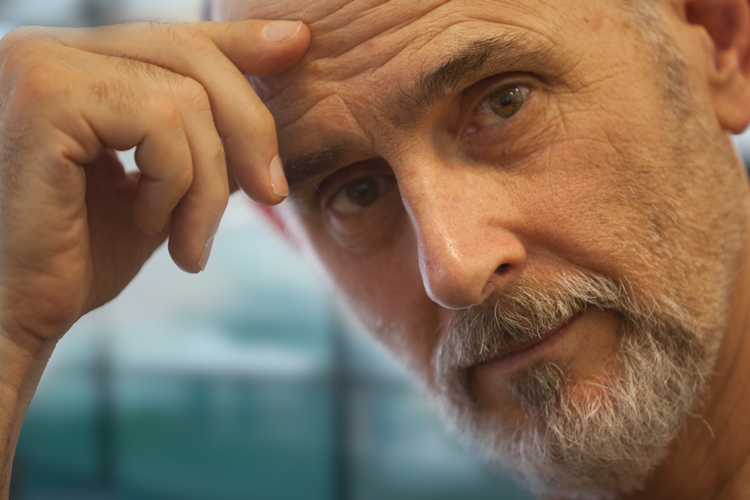 John said "I do love creating images, but seldom create ones that won’t earn me money. Even on vacation or traveling I will find myself reaching for my camera when a potential shot catches my attention, and yet I am always wondering if and how I can make money with the shot. I have foregone some pretty cool shots because I couldn’t see how I could make money with them." I couldn't have said this better, totally true for me as well. Sometimes my family members give me a hard time about the photos I won't take. Nothing wrong with a professional approach, John. An amateur, in the truest sense, is one who takes photos for love. It would be much easier for professionals to make a living if amateurs would do it for love AND money.